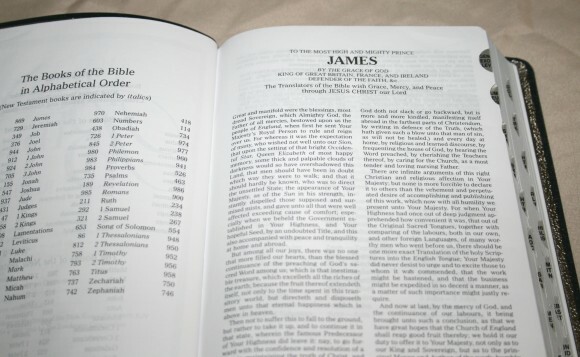 The Zondervan King James Reference Bible is a hand-sized Bible that’s great for carry, but still contains plenty of features for use as a primary study Bible. It has plenty of material at an amazing price. 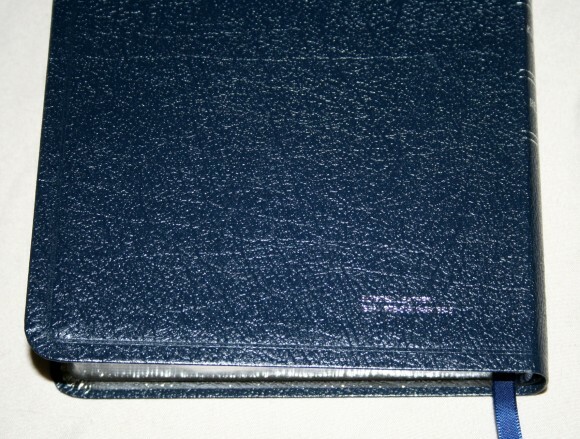 In this review I look at the bonded leather edition in navy blue with thumb-index. The cover I chose for review is navy bonded leather. I rarely get my hands on anything navy and it’s nice to see something different. I love the color. 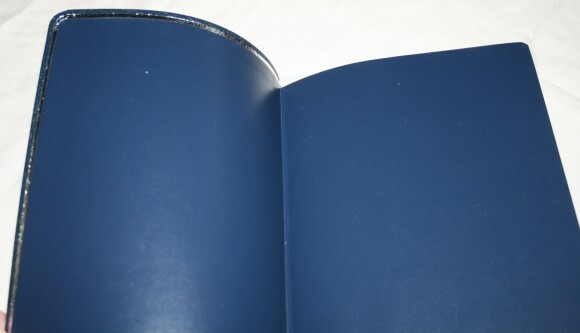 It’s a very dark blue with silver highlighting and gilting. There is a silver line that traces around the text-block to further highlight the silver on the blue. The liner feels like vinyl. At first I wasn’t sure that it was sewn, but then I found threads in the maps’ section. It will take a while to break in the bonded leather before it will lay flat. Once it does it will have no trouble staying open in Genesis. The paper feels like the same paper I’ve seen in other Zondervan Bibles. It’s thin (making this a slim-line) but it’s also opaque enough to not be distracting. I haven’t tried writing in it, but I think this would be good paper for writing. The font is 7.2 with around an 8-point leading (but I’m just a guessing about the leading). There are no pronunciation marks. This keeps the text clean and easy to read. The print quality is consistent throughout. The red-letter is about a medium shade of red. The red-letter goes all the way through Revelation (like any red-letter Bible should in my opinion). There are over 45,000 center-column references. 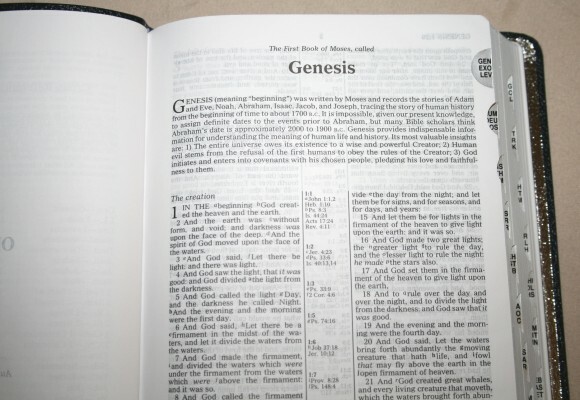 There are 7 references for Genesis 1:1. They are keyed to the text by letters in italics. Chapter and verse numbers are printed in the center-column and the keys are printed under the verse it is keyed to. This is my favorite method for printing center-column references. Translation notes appear at the bottom of the page under the right-side column. They are also keyed to the text with letters, but instead of italic they are standard and printed in bold. It is easy to tell them apart from the references. 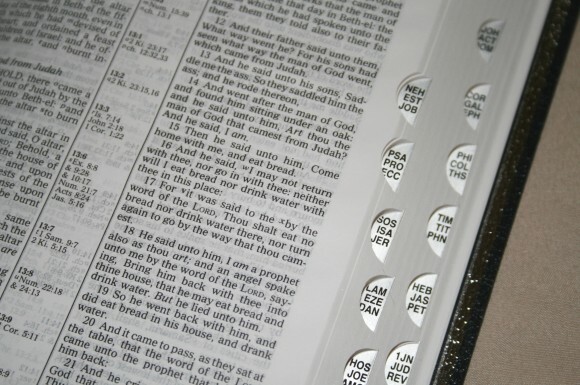 Translation notes show alternate renderings in Hebrew, Greek, Septuagint, etc., show clarity for words that may have changed meanings (or similar), show alternate names for people and the verses that use the alternate name. There are lots of notes throughout the text. 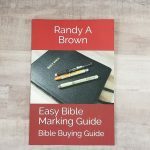 They are very informative and help make this a great Bible for study. Book introductions are a succinct paragraph that appears just before the text of the book. They include insights about the setting, author, history, culture, purpose, facts, etc. They often give events with their verses, creating a simple outline of the book. It’s hard to find section heading’s in a KJV that’s not a study Bible. I like the addition of section headings because it breaks the text up, making it easier to read and find what you’re looking for. There are a lot of them, but they’re not overdone. They’re pointed in an italic font that’s the same size and boldness of the Biblical text. They’re helpful and easy to use, but at the same time they’re easy to ignore if you just want to read the text. This edition contains a thumb-index. It’s printed as black text on silver and looks great against the silver gilting. Each tab has 3 book names. Books that contain multiple parts (1 and 2 Kings, 1 and 2 Chronicles, etc.) are combined. This means a tab might only have 3 book names, but could refer to more than 3 books, making some tabs more difficult to use than others. The concordance is 46 pages. It is presented in 2 columns per page. It isn’t a large concordance, there are 12 entries for “God”, but is covers the basics well. It is still good for common searches and between the concordance and the references you’ll find what you need. There are 8 pages of maps. Maps are in full color and printed on thick paper. They are labeled better than average and are easy to use. 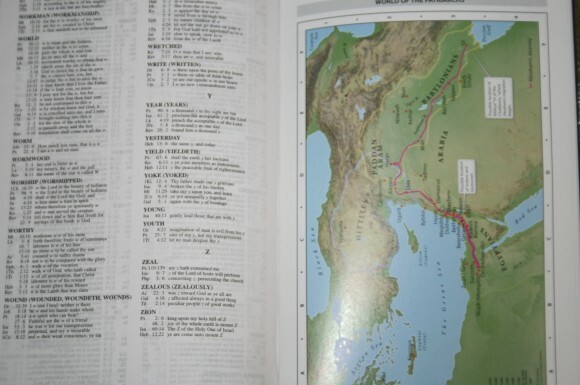 I would like to see an index to maps, but it is less needed than in other Bibles due to the notes and labels. 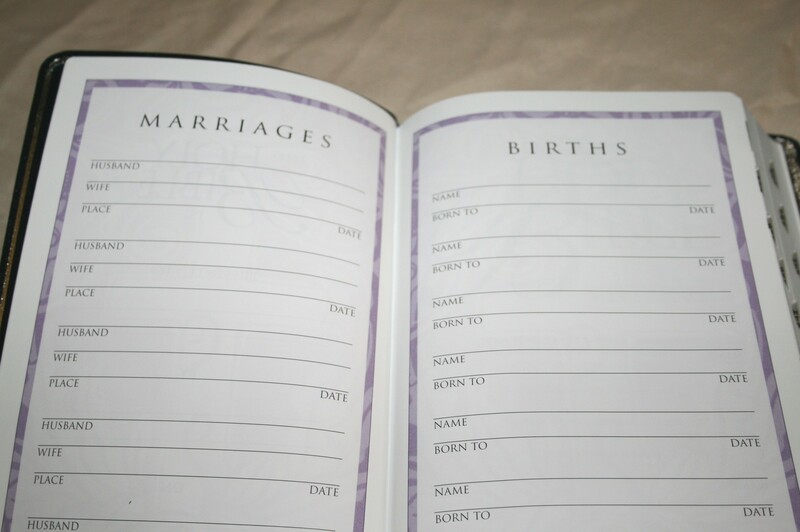 There are a lot of features in this Bible. It’s the perfect size for carry and reading. 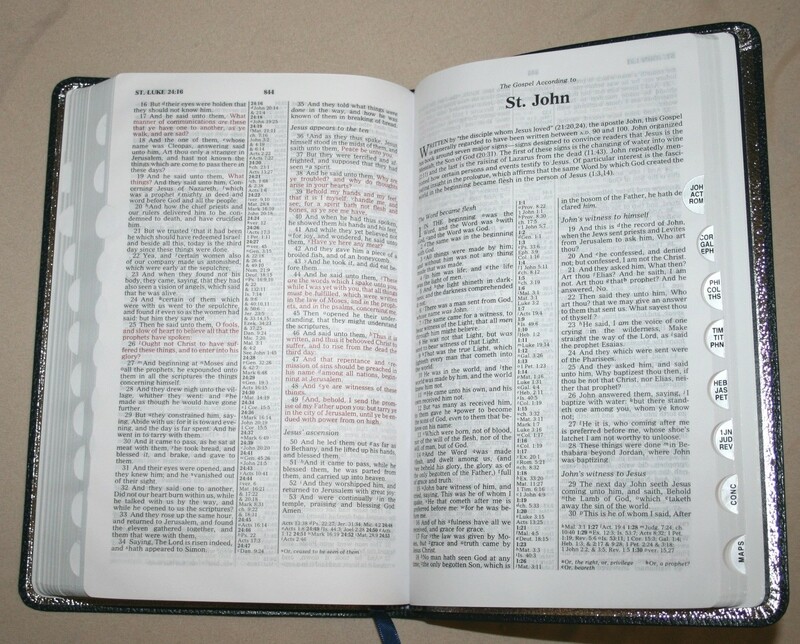 It has great tools for study, witnessing, teaching, etc. 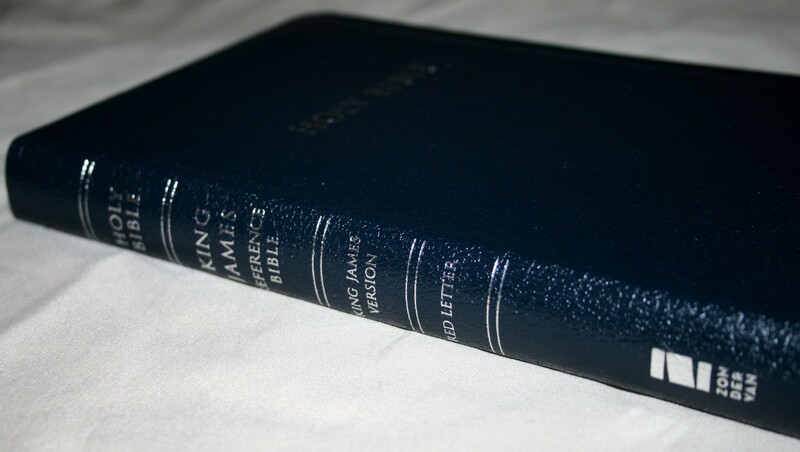 I highly recommend The Zondervan King James Reference Bible for anyone wanting a good Bible on a budget without sacrificing features. Silver gilt is good. Thumb index is bad. China printing and paper is so, so. Probably will sell a.lot at Walmart etc. Great review. 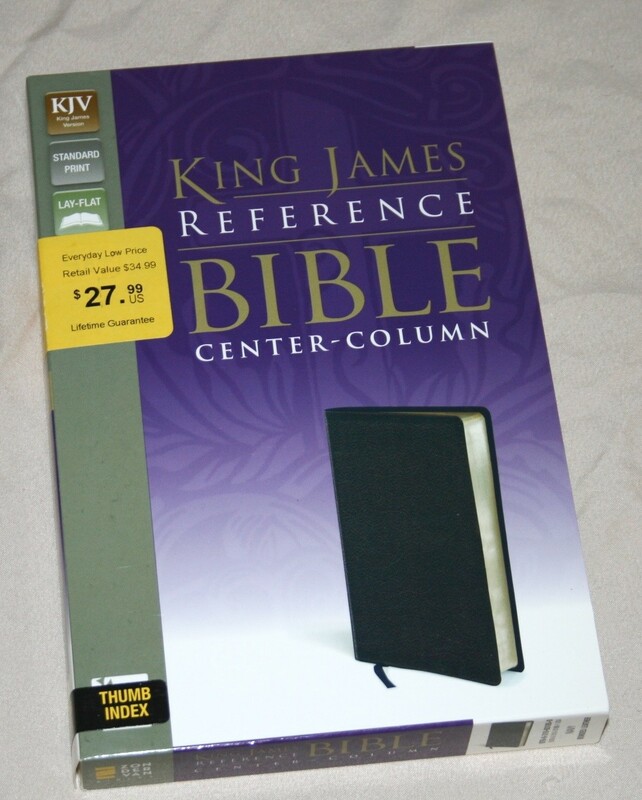 I have this Bible, and I’ve seen most of the KJV bibles currently on the market. 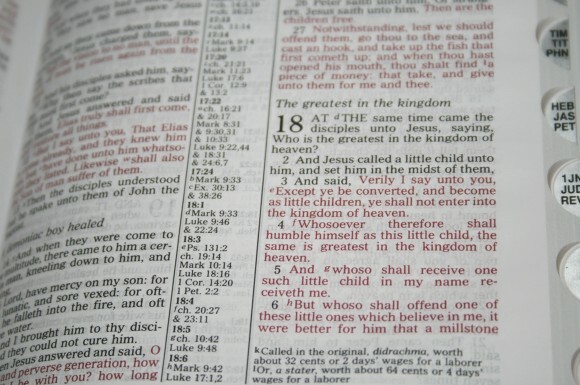 In terms of features without any commentary, it’s my favorite KJV. My only question is: Why hasn’t Zondervan published this in a full-size larger print?! 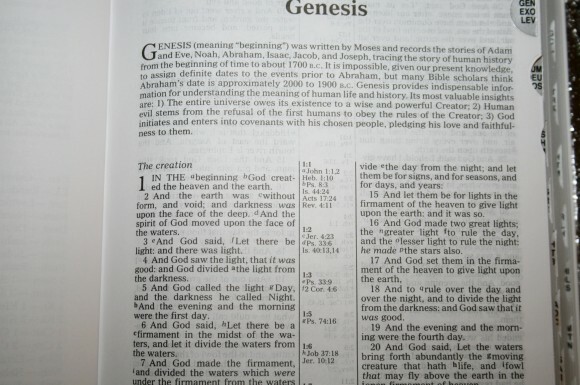 They did publish the same Bible in Large print. My copy is the same blue bonded and is a great reader without being too large. 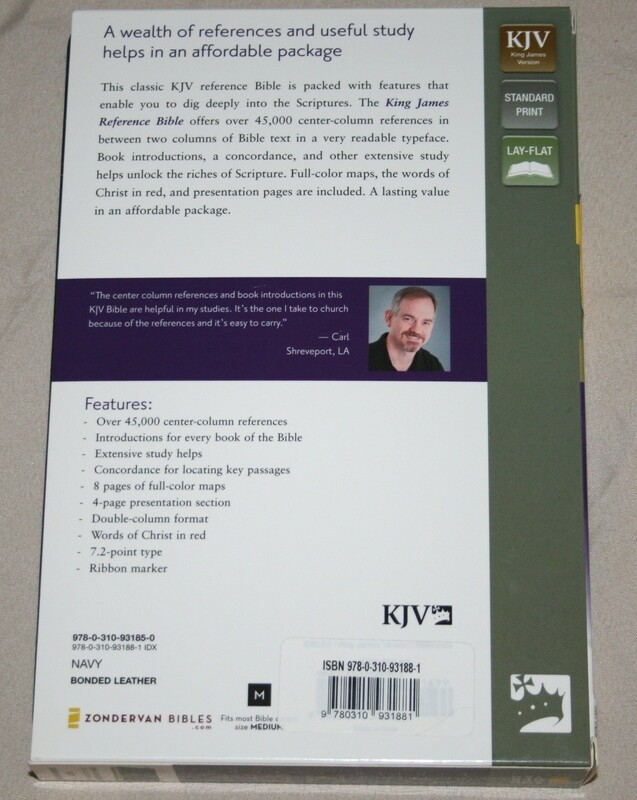 This looks like a useful study Bible in a good translation,( I like the Authorsied the best for my personal use). I question the durability of Bonded Leather, for longevity it is right up there with cheap paperbacks. There was a time when Zondervan, Collins, World, Nelson and others had only a few editions available in hard bound or inexpensive (CHEAP) bindings like these, now Bonded Leather seems to be top of the line for most USA publishers. The durability of Bonded Leather relegates this otherwise fine printing to occasional carry or to life on the shelf as an occasionally used reference source. I haven’t handled this particular Bible, but others with a Bonded Leather cover have fallen apart after a few weeks of regular carry or hard use as a desk reference source. It is a shame it is not bound in good basic cowhide or even better French Morocco, premium calfskin or Highland Goatskin would be nice also. For my own use, if I decided to purchase this Bible, I’d look for a good hardbound edition if it is available. I would love to have this in a good cow hide or calf split. 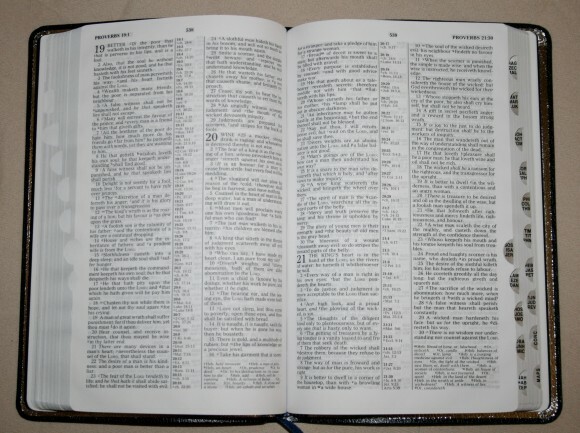 I owe you all an apology about the tone of my comment on this Bible. I am just frustrated in seeing otherwise good products bound in fragile covers like this that limit the life of the product if it is used regularly. 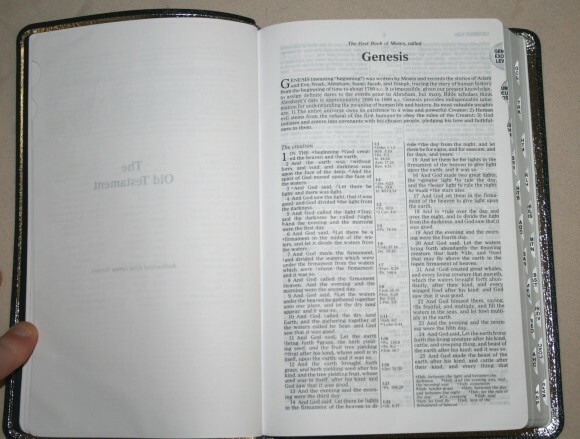 If this Bible was bound even in the plainest cowhide or even pigskin it would greatly increase its longevity, and make it a truly useful product. How much more would a basic leather cover cost? I think anyone would pay $5-$15 more for something that won’t fall apart after a short period of regular use. A good stitched hard bound cover would at least provide some longevity. There seems to be fewer and fewer good quality bound Bibles being produced in this country, it is a real shame. Hi Don. Thanks, but no apology necessary. Your tone shows your frustration with low quality bindings and publishers’ desire to keep producing them with no care for quality. I share your frustration and concern. It’s terrible that quality bindings are the exception and not the standard. Mr. Denison I agree with you. There was a time when the luxury editions were the norm. Now you really have to pay to get a well bound version. 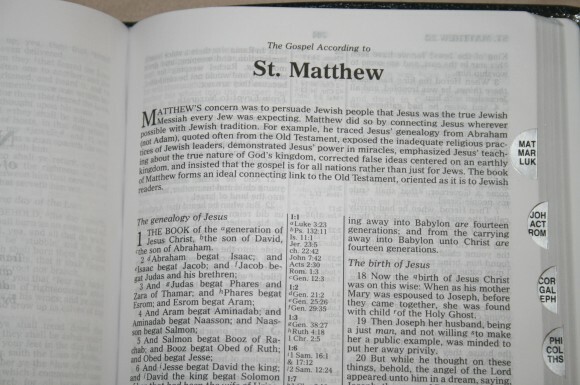 What disappoints me is that American Publishers are cranking out these Bibles you are referring to. Other than Local Church Publishers there are really no publishers that come close to Cambridge and Allen quality in the States. @Mr. Brown, Yes, I was looking at that new Schuyler the other day. It most certainly is very intriguing. 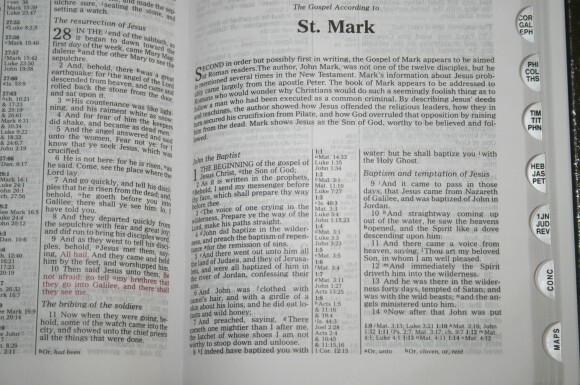 As far as Church Publishers, I would like to see them offer an edition that competes with the Longprimer as well. I wish they would do some goatskin offerings as I understand they used to in the past. 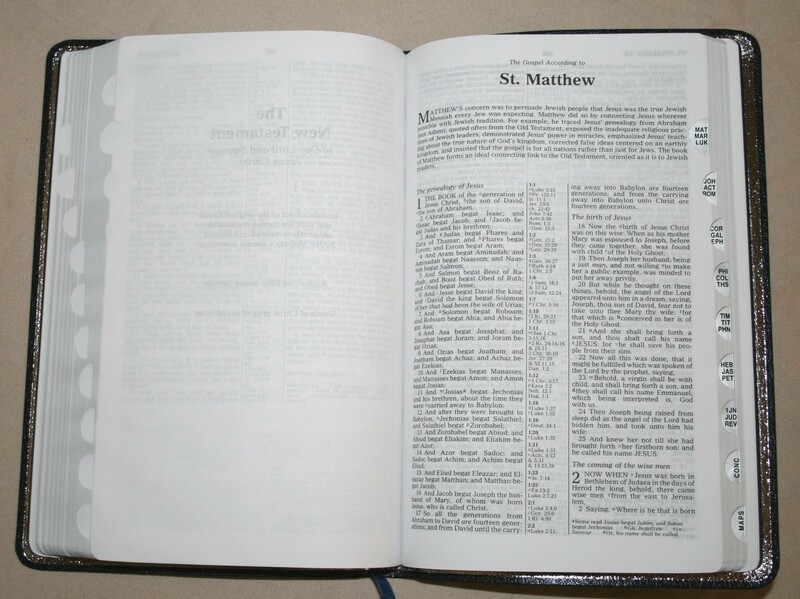 What is your favorite Church Publishers Bible? Mine is the 110 series in top grain cowhide. Hi Charles. I like the Note-Taker’s (400 series). Mine is Executive 1 piece black. I also like the hand sized text. Mine is the vinyl 380 series. I’ve considered the 390, 110, 120 and the 225 series. The 110-120 is an excellent all-around Bible because of the references and note space. I might buy that one is the Signature series when they get it back in stock. Another of my favorites is the Thompson, but they don’t make that one anymore. I’d also like to see a Concord or Brevier Clarendon in both regular size and wide margin. I read the description of the signature series on the website. Is there any significant difference between the signature series leather and the top grain cowhide? They seem to be the same. That’s a good question. I’d like to see them both so I can compare them. I have purchased two of the 110 series, they are in a Cambridge version of the Brevier from some years back, it has a good concordance and cross reference system and maps probably from that earlier Cambridge edition. 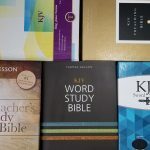 I looked over these Bibles carefully before giving them to my daughters, they are great for carry, compact with large enough type for easy reading. 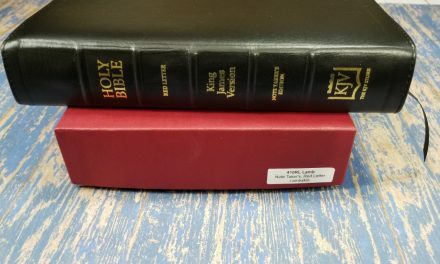 For serious study, they will need a Bible Dictionary, and perhaps a Commentary, I always have these on hand at home and seldom find need of these supporting features unless I have sat down to do some serious reading. For carry the 110 is ideal in its size and font size, it is also beautiful and well bound. Hi Don. Thanks for the info. This one is high on my list of Bibles to buy. 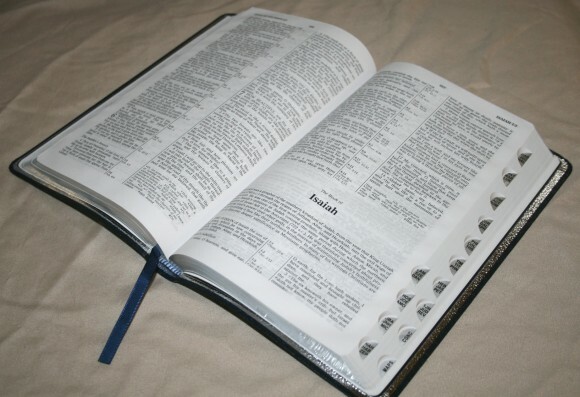 I think that you understand probably better than I that the use a Bible is put to is perhaps the most important factor to be used in making a choice to purchase any given one. 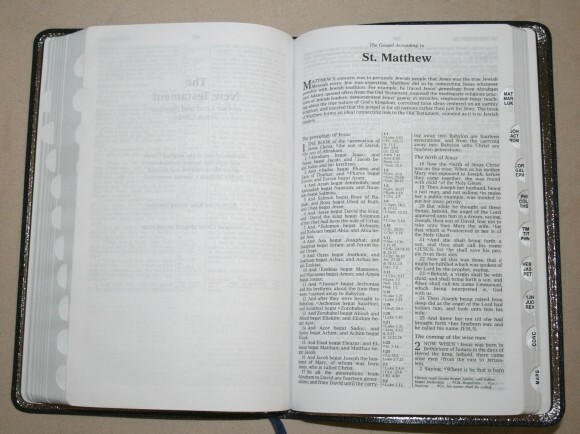 Potential length of service in the use that the Bible will be put to is also very important, that is why Bonded Leather products are such a poor choice for real use. 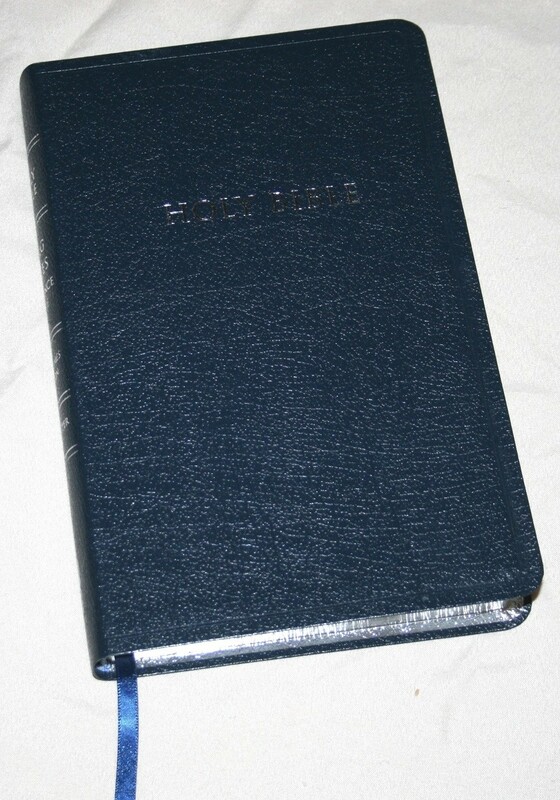 Bonded Leather is fine if the Bible is to be used as a prop for church attendance or a coffee table decoration, but if real use is part of the plan, the short lived cover will let the user down regardless of the excellence of the rest of the Bible, such covers should come with a warning that this Bible is for appearance only. 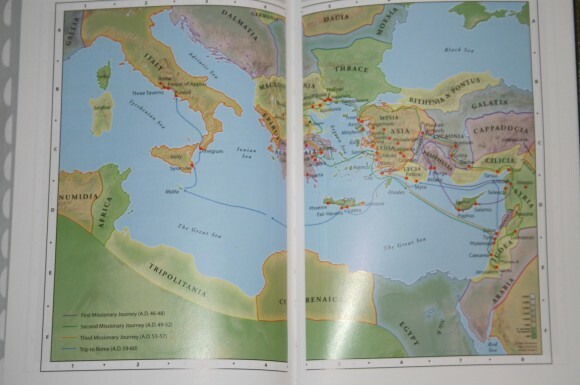 You will like the LCBP 110, it is attractive well bound and well printed in a font of about 8 point, it is ideal in size for one handed reading and has a good concordance and a serviceable set of maps. It will rest comfortably on a chairside reading table, tempting you always to pick it up because it is so easy to handle and read. 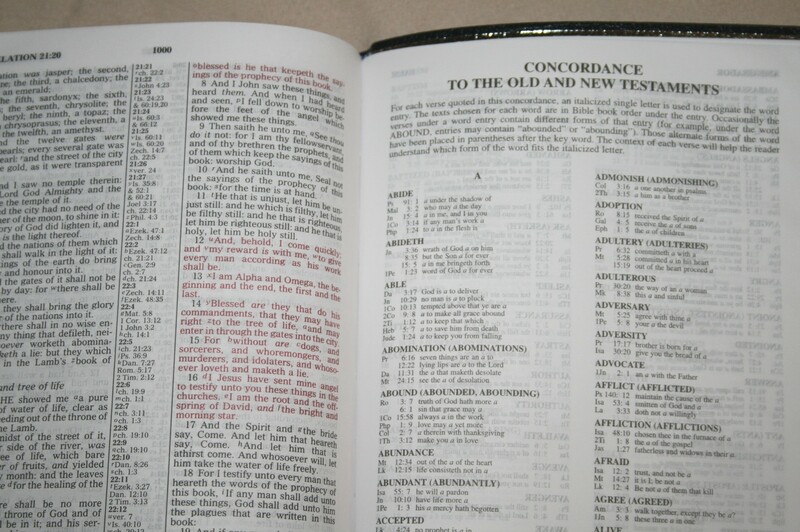 My Cambridge Personal Concord serves me well in this capacity or I would have bought a LCBP 110 for myself as well as for my daughters, a Bible of this size also serves well as a companion while seated in a pew or in a Sunday School class. 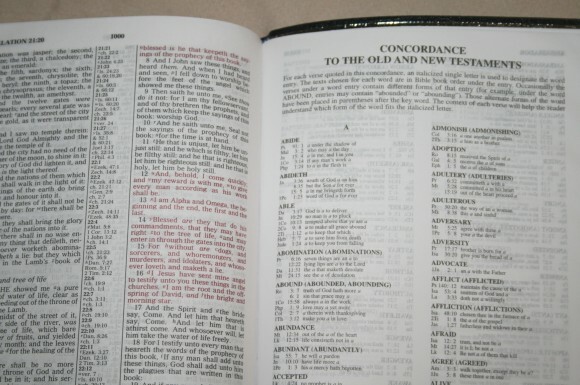 I’ve found so called Full Featured Bibles like the Thompson, or the Westminister Reference wonderful, but the 5X7 inch size gets carried more and read more, and unless I am doing serious research at a desk or table the smaller Bible gets more use. Hopefully our domestic publishers read this blog and will learn a little from it and the comments made by you and your readers. We can only hope! Thanks Don. 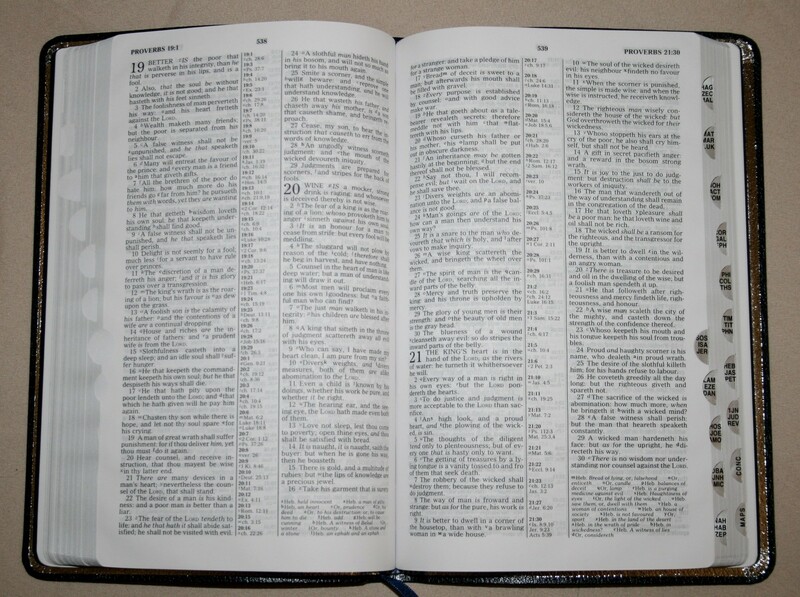 I love Bibles that make me want to pick them up and read them. I find that I use the smaller Bibles more than ever because I like the one-handed use (I usually have a cat (or cats) in my lap while I read, so being able to hold it in one hand is a must). My favorites are the Pitt Minion, Cameo (same as 110), and the Clarion and Concord (although they’re still large by comparison). I love the Cameo and Concord and you’ve convinced me that I need the 110 as well as the Personal Size Concord. They’re next on my list. We do have publishers reading our comments. That’s why I’m grateful to readers like you that take the time and tell what you like and don’t like in a Bible. You help publishers make the tough decisions about how to design and publish what readers want and need. Thanks! I must apologize for an error I made in my earlier comments about the LCBP 110, while it is an excellent printing, the version I liked so much was the 115, its more compact version. The type and other features are exactly the same but it doesn’t have the larger margins and thus is easier to handle, carry and read while being held in one hand. Please forgive my error and my memory. Fortunately this is the first mistake I’ve ever made, I thought I had made a mistake earlier, but I was wrong. 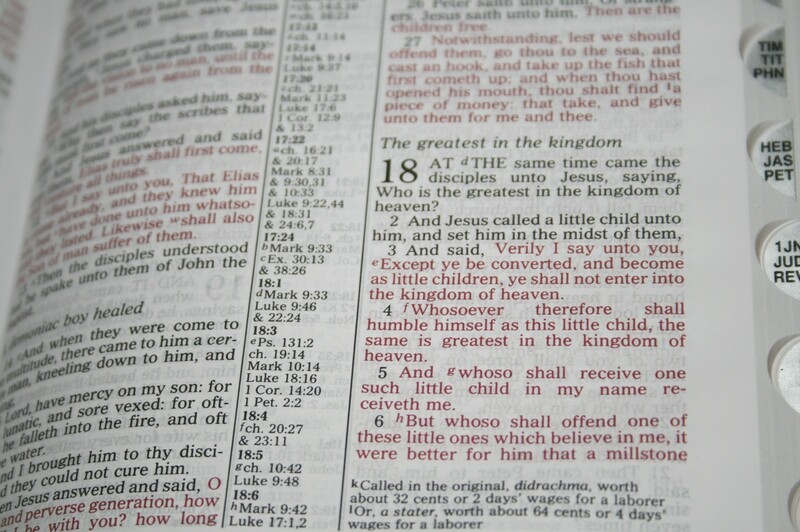 Seriously, check out the LCBP 115 it is a good and useful edition of the Bible. :0D The 110 is the LCBP version of the regular Cambridge Cameo. I haven’t seen the LCBP, but the Cameo is a nice Bible for carry and reading. I’m sure the 110 is a fine Bible. Your mention of small Bibles brought to mind one that I bought from TBS, a reduced Pitt Minion with a nice calfskin binding. The print is very small, but the portability is extraordinary! 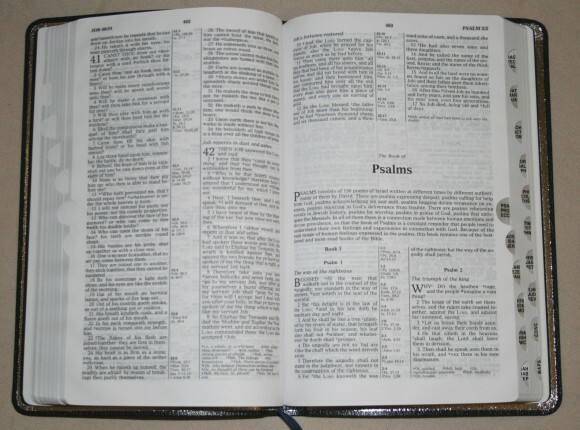 I can easily put this Bible in my shirt pocket, and if I make sure the spine is placed where the seat belt crosses, there is no danger of damage. This Bible gets a surprising amount of use, I carry it everywhere unless I’m going to church or a Bible Study where the small print will make it difficult to read. I’m thinking of getting one of those flat page magnifiers that will fit inside the bible. The font is probably on the small side of 6 point and requires good eyes or well corrected ones and good light. It was worth the $40 just to have a truly portable pocket Bible. They are also available with zippered calfskin cover and index detents, or at least they have been, I’ve not checked lately. These Bibles have a reading plan, and Cambridge Cross References in the center columns, no concordance, no maps. Hi Don. This sounds like a good Bible to keep in your pocket. I’ll have to take a look. 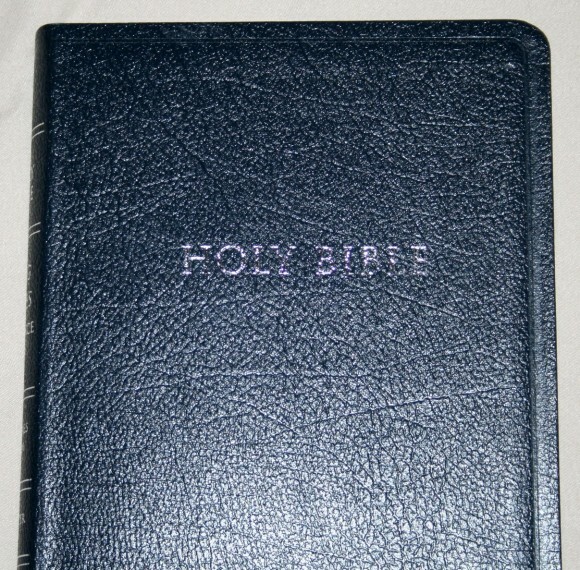 This Bible will indeed fit in a normal shirt pocket, and is also available with metrical psalms, and is still available with a zipper cover in calfskin that will protect the pages very well. Hi Don.I’m glad you responded again. I got their catalog in the mail today and now I know exactly which Bible you’re referring to. It does look like a good Bible for carrying in your pocket. I’ll end up getting it. Does it have the same cream-toned paper that the Windsor has (that’s my favorite)? I also like the look of their Royal Ruby. The paper is thinner, pretty white, and does not have as much of a cream tone as the Westminister, but it does have enough of those tones to make it easier on the eyes. If you have looked at their catalog, you should see that this bible is offered with a calfskin cover with indexing cut in and a zipper closure that should really protect it from damage in pocket, purse or pouch. The paper is forgiving of creases and crumpling and they seem to iron out any mis-haps in time. Line matching is good so the next page does not bleed through except in blank areas. I really like my copy, it is so easy to take with me and enjoy reading God’s Word while I’m waiting in an office for an appointment or am in my car waiting for someone. I don’t miss the concordance and other helps for this kind of reading, but find the Cambridge Cross Reference System very useful. 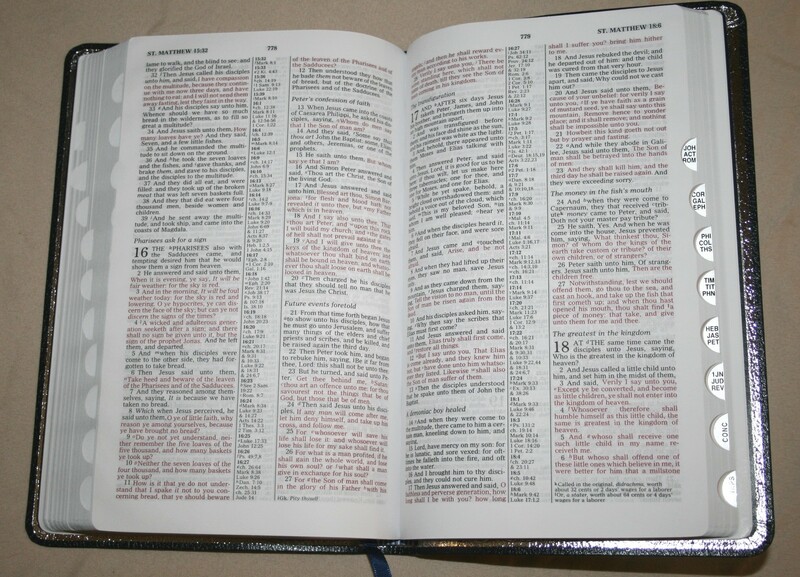 I hope you enjoy this little bible as much as I enjoy mine, it is designed well for its intended purpose and even my 72 year old eyes corrected with glasses are able to read it without too much difficulty as long as I have good light. Larger print is always nice, it is a trade off in size, portability and readability. This bible fits its niche perfectly. The Royal Ruby by the way does not have references, it is text only. 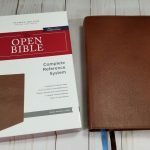 TBS also publishes a bible based daily devotional volumne bound in calfskin called the Daily Light I may give this a try. 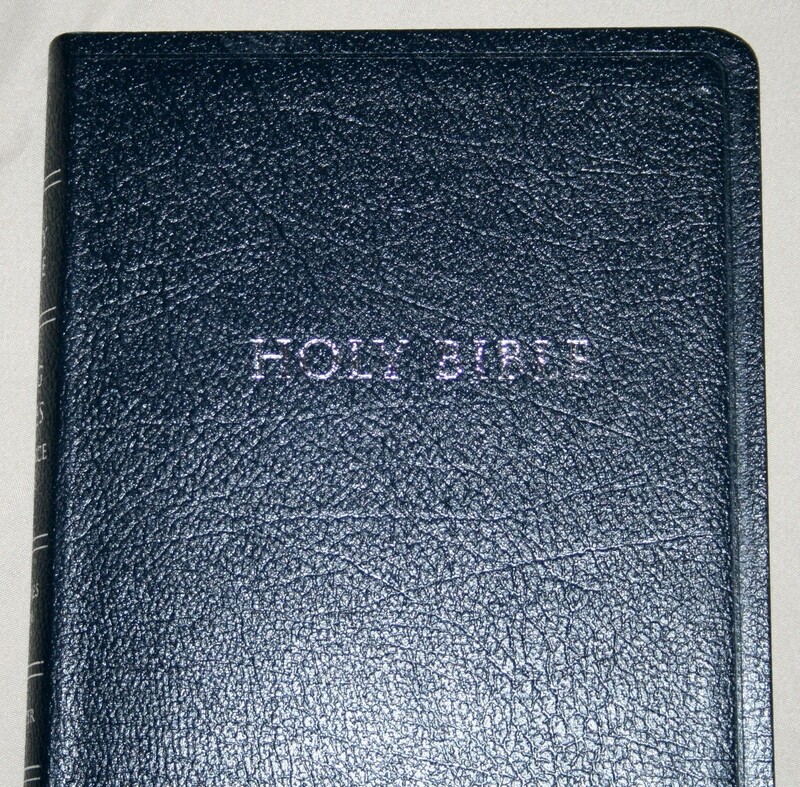 I just checked with TBS’ sale page, evidently they no longer the zippered cover on this bible. It really doesn’t take a lot of attention to protect the pages from creasing or rumpling, but due caution has sufficed for me now for a couple of years. I suppose one could get a good repair shop to install a zipper, but these bibles are so reasonably priced that even if one is badly damaged it is easily replaced. I don’t know how they do such a good job for so little money. 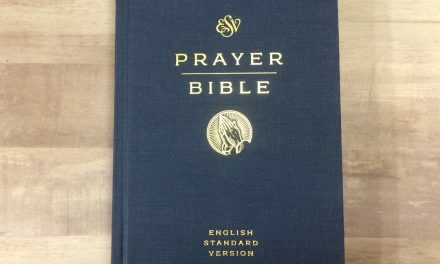 Are all of the photos (particularly the ones with the bible still packaged) of the same version/product? Hi. They are the same product.